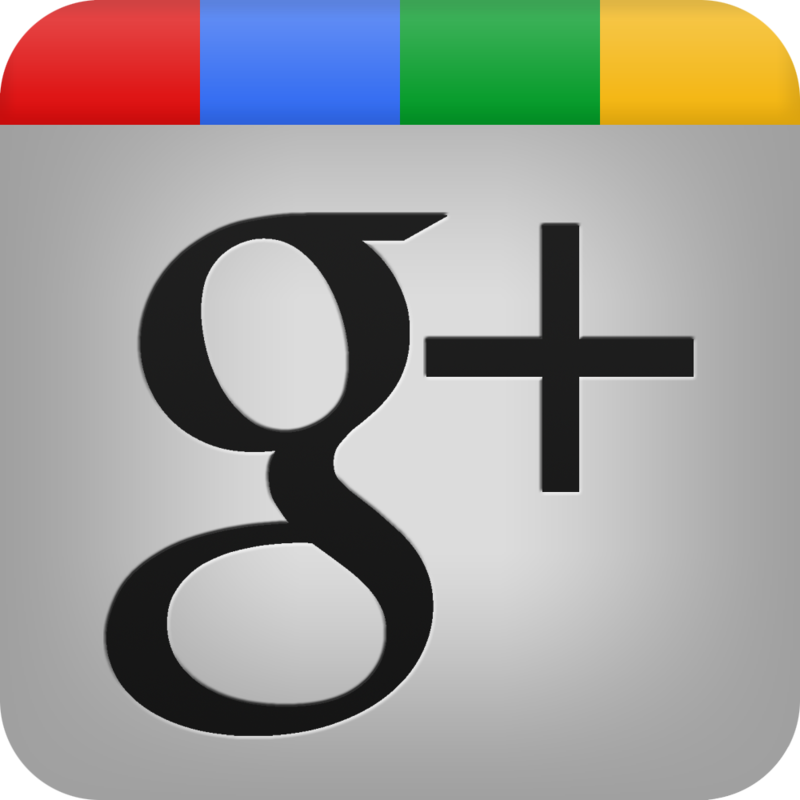 Welcome back to the CSH Blog! I hope you’re having as much fun doing these things as I’m having writing about them! Don’t forget about your Saint fun pack! 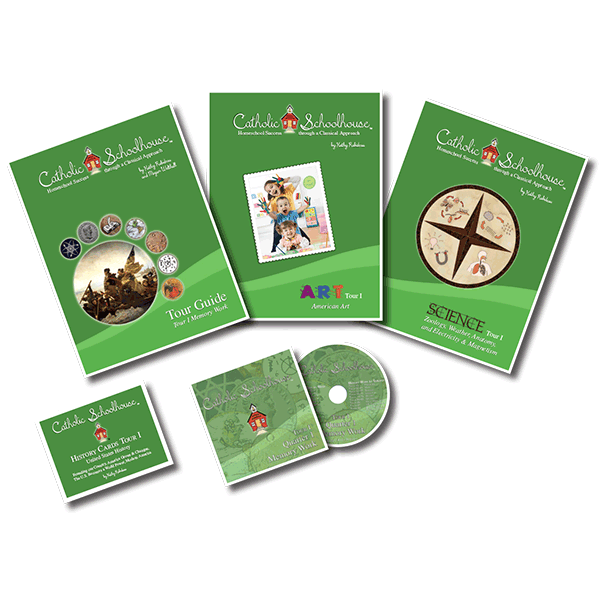 Pull out your Saint Elizabeth Ann Seton Fun Pack and complete the activities for Week 8. Students learn about polygons this week! Create this cool Geoboard to practice your polygon making and naming! 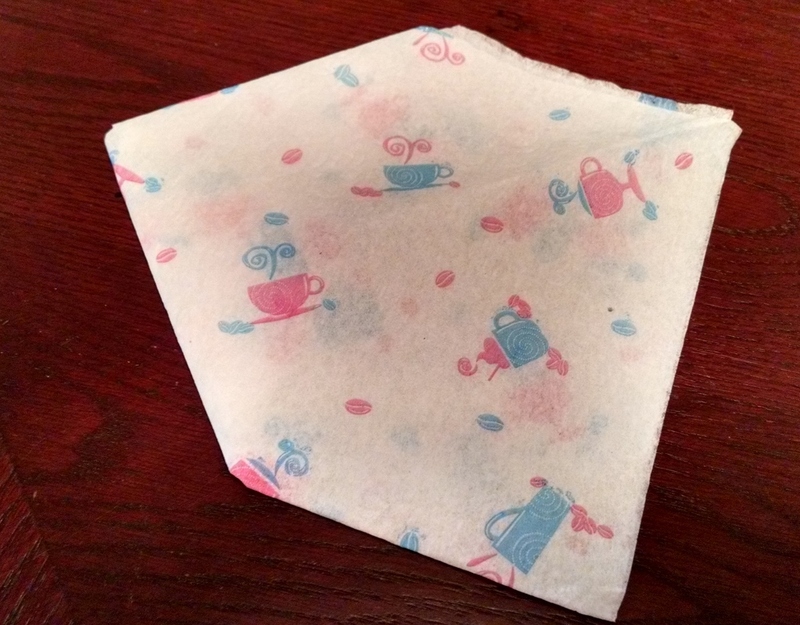 Next time you’re at the dinner table together, challenge your students to make different polygons (and name them) with their napkins! Let your students know they don’t have to be ‘regular’ polygons (not all the sides have to have the same length). 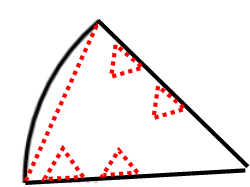 Fold it corner to corner to get a triangle. 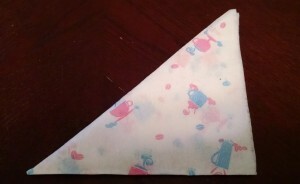 Fold two corners to the middle and you get a shape with 5 sides! A pentagon! 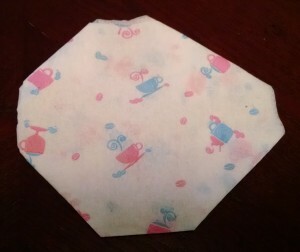 Fold the corners of your square in just a little (not all the way to the center), and you’ll get an octagon. How many shapes can your students come up with while eating? 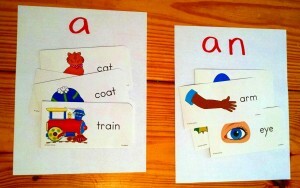 Do you have flash cards with words on them from back when you were teaching your 1 year old what things were called? I do. 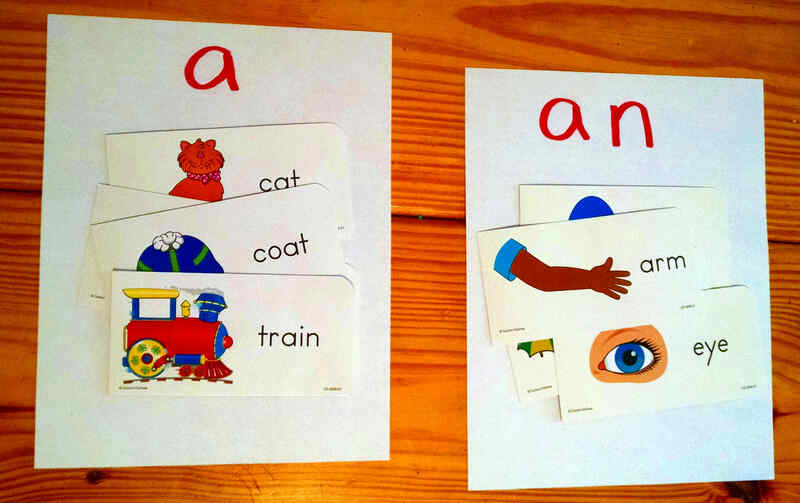 They have pictures of airplanes, lions, teddy bears – all the sorts of words you want your child to have in his/her vocabulary. Well, if you still have them – bring them out this week. Grab two sheets of paper, and write “a” at the top of one and “an” at the top of the other. Quiz your students by having them sort the cards according to the correct article. ( an airplane, a bear, an apple, etc). If you don’t already have the cards, I wouldn’t bother purchasing any, just write some words on paper pieces or note cards and you can still play the game! Here’s some trivia for you: how many stars were on the star spangled banner when Francis Scott Key wrote this poem? Have your older students study the background of the Missouri Compromise. Then have them choose a side and write a persuasive speech to support their side’s view. Make sure your student clearly states what his/her side is (are you pro Missouri being a slave state or against it? ), and explain reasons why. For the older students, challenge them to consider what the opposing side would use as reasoning for their views, and add counter arguments to their speech. Appealing to the emotions of your audience is key in persuasive writing. If you have several students, see if you can get two to choose opposite sides. Allow your students to give their speech to the family, and then ask at the end if the speech changed their minds. The Trail of Tears is a long, long journey that the Cherokees traveled in their forced relocation by the white settlers. One of the more used paths, has become a National Historic Trail, and there are several access points and parks along it. If you live in Tennessee, Kentucky, Illinois, Missouri, Arkansas, or Eastern Oklahoma, take a field trip to one of the many parks. Walk the paths, read the info boards, and visit the stores. Plan your trip using National Park Service Trail of Tears website. The Erie Canal is a great way to introduce your students to how waterways have been adapted for shipping vessels to pass through. Learn about canals, locks, gates, gate paddles etc. Momma’s learning corner has a great blog post already about the Erie Canal, with a book recommendation The Amazing Impossible Erie Canal by Cheryl Harness, printable worksheets, and youtube videos of how canals and locks work. I stumbled upon this fun site called Mission US. There are 3 games available. In mission 2, you play the part of Lucy, a 14-year-old who’s goal is to escape slavery. It is played out like an RPG (role playing game), where you are presented with various things to do and say. If you make the right choices you may escape slavery. I have played through it twice now, and found it pretty entertaining. Some of it is a little too real for your littlest students, and reading is required to play the game. I would recommend it for your 3rd grade and up, and follow up the game with some good discussion. I like that it presents (what I imagine to be) a realistic depiction of the struggle of slaves escaping, as well as it teaches vocabulary. To complete Mission 2 you will need at least an hour. It is set up in 5 stages though, so if you want you can easily limit your student’s game playing time by allowing only one ‘stage’ a day. Do you live in or near Raleigh, North Carolina? The North Carolina Museum of Art has an exhibit of J.J. Audubon’s Birds of America on display. If you live nearby or are planning a trip anytime this year that takes you near Raleigh, be sure to stop by and see his work first hand! How is your quarter collection (recommended in the Week 7 post) coming? If several families in your program are collecting quarters, you could use some time before or after meeting to trade quarters for the ones you ‘re missing! This might be obvious–but, if you live in the Southeast-Take a field trip! Go to one of these Southeast Features. Fall weather is perfect for the outdoors, especially the Blue Ridge and Smoky Mountains. My daughter thinks it’s fun to use tracing paper to draw the states. 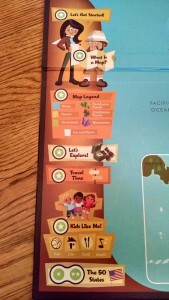 I guess that’s an added benefit to having a sturdy cardboard map. Sorry I don’t have a picture of her actually using the Tag Reader Pen. Of course it’s used all the time except when I’m trying to get a picture of it! All the Green Circles with stars in them are games you can play. 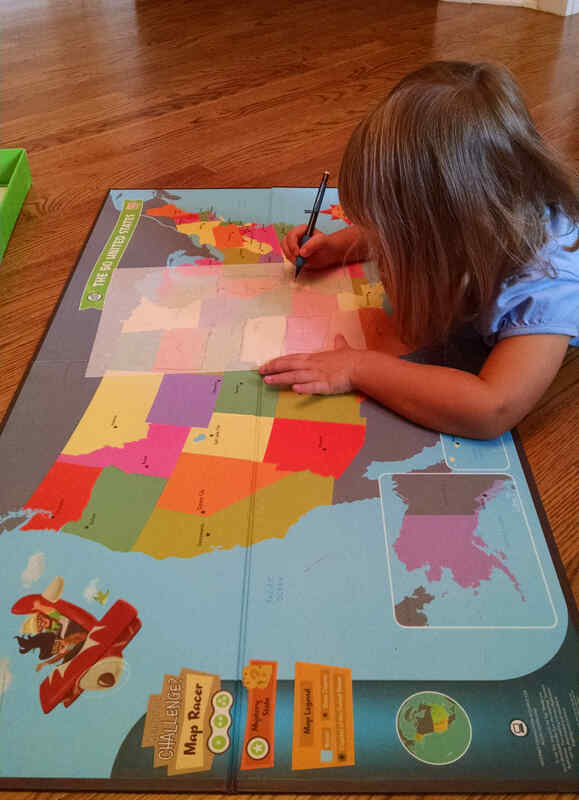 The “Kids Like Me” teaches what type of music, food, games, and lifestyles are in the different regions of the US. The “Lets Explore” was the game that the California Gold rush example was from. Check out Part 2 of the Southeast States Lapbook! Add the fun flip pages for the Southeast Features! 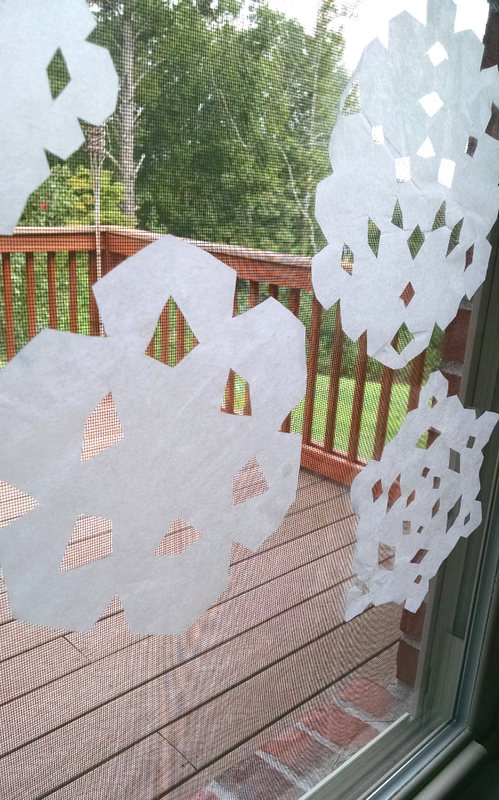 I know it’s nowhere near winter yet (in fact, it’s 95 degrees F outside here, right now), but you can think chilly thoughts as you make paper snowflakes while learning about precipitation this week. 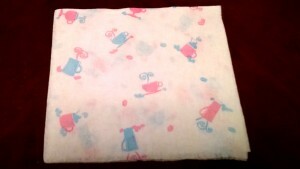 Take a coffee filter, fold it in half. 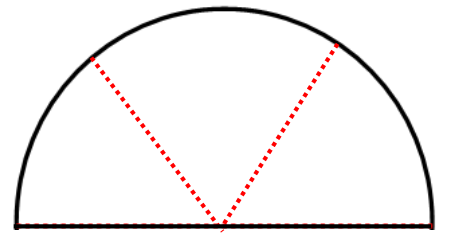 Now fold it in thirds along in the radius, so you keep one end pointy and the other is the outside curve (pictures below to help). Then take some scissors and cut the curve part off. (for a prettier snowflake you could start at the ‘corners’ of the curved part and cut inward. Next, cut little triangles out of the sides. Unfold and you have a snowflake! We like to stick these to our windows in the wintertime. If you want them to lay a little flatter, you can get them wet, spread them on a table and let them dry. Here are our snowflakes! Just a side comment: When I was in school (a long time ago) we made these by folding copy paper in half and then in half again- there’s nothing wrong with that. But if you’re making paper snowflakes, folding them as I described above gives them 6 sides which is characteristic of a snowflake ice crystal. The reason we used coffee filters is because they are cheap, already the right size, they’re round, and they’re sort of translucent in the window, which I like! Have fun this week, and as always, thank you for reading! Links to Amazon.com from this blog are affiliate links. This means when you use our link to purchase something, Catholic Schoolhouse receives a small portion of the proceeds. The price is same whether you use our link or not. The money earned from our Amazon Affiliate program is used to continue providing homeschooling resources and keep the blog going. Thank you for your support!